PC audio quality is the main concern for people while planing to purchase a new computer. The quality of the sound depends upon both the hardware and software facilities of the PC. The basic configuration of every computer will have default audio chip for processing audio. For more accurate and we might need to add another audio card. The software at the PC end should be capable of processing the audio signals delivered by the hardware. Windows media player and other media players play these sound files without much modulation. High end media players like PowerDVD and WinDVD include sophisticated audio processing technologies like Dolby, SRS, etc. for processing two channel, five channel and even seven channel sounds. However, these players are not free. 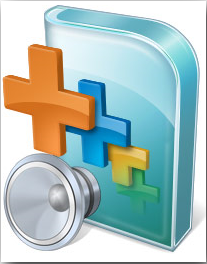 So here are few low cost software alternatives to Improve the sound quality in Windows. 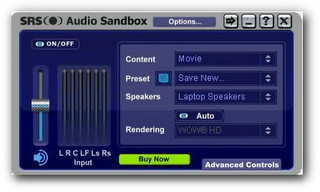 Many people are still unknown about audio applications like SRS audio sandbox. SRS audio sandbox is an awesome companion for music lovers and extreme gamers. The bass and clarity provided the application is otherwise only available on a costly DVD software player. SRS audio sandbox installs a driver so that it works between any of your media player and hardware device to tune the output audio. So we can use this application to work with your favorite media player. It includes a set of SRS technologies like SRS Tru surround, SRS headphone, SRS Circle Surround and SRS WOW HD that you can select on the basis of your requirement. We have earlier reviewed this application that you can check here. SRS provides a 14 day full working trial of SRS Audio Sandbox for Windows. After the trial period you can purchase the application for 24.99 USD . Recommended app for true music lovers . Update: SRS labs official Facebook page provides coupon codes for all SRS software applications so that you can purchase them at a lower price. 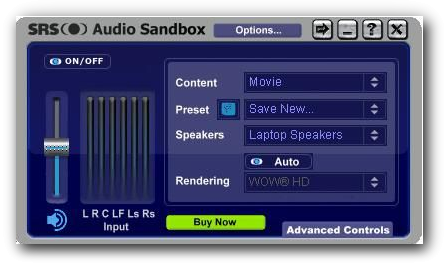 The current coupon code SRS10055 gives a 5$ reduction on SRS Audio Sandbox’s normal price. SRS WOW Effects plugin is added in Windows media player to improve the bass and clarity of the audio output. But this plugin is not ON by default. You can enable SRS WOW Effects plugin from menus >Now playing >Enhancement > SRS Wow effects. Improve sound quality DFX Audio enhancer. FXsound DFX audio enhancer is audio software for Windows based software players like Windows media player, Real Player SP, DivX player and WinAMP. 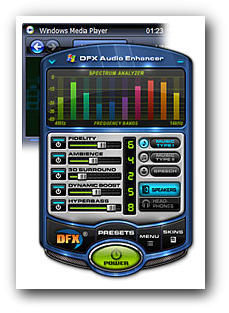 Unlike SRS audio sandbox, DFX audio enhancer is not universal. That is, for each media player you need a separate DFX enhancer. Furthermore, the well renowned SRS and Dolby sound technologies are not available with this application. Still you will feel great improvement in sound when this application is launched. There is a set of audio presets and sliders that you can arrange to set your audio preference. DFX is also available as a limited trial version with some options removed. If you want to feel the full experience of DFX enhancer, check out the 30 day trial of the application with a promo offer for DivX pro 7 for Windows.